NEW GLOUCESTER — Voters signed off on the coming year’s budget at the annual town meeting in New Gloucester Monday night, but not without some renewed debate over Selectboard term limits and firefighter compensation. The $4.4 million fiscal year 2019 expense budget will result in an estimated 3.6 percent increase in the municipal portion of the tax rate over the current year, according to budget materials provided by the town for the May 7. Coupled with expected SAD 15 and Cumberland County tax increases, the town projects the overall tax rate will increase 4 percent in 2019 from $15.60 per $1,000 valuation to $16.30. Individual warrant articles approved at the meeting included capital projects such as $150,000 for a new public works department dump/plow truck, $37,500 for tennis court improvements, $35,000 for bridge and dam engineering at Stevens Brook, and $30,000 for an expansion at the town library. Early in the meeting, resident Penny Hilton proposed an amendment to the operating budget to remove a portion of Selectboard compensation, $5,200, and cut legal funding by $11,000 – which she framed as a response to the board’s recent vote to invalidate the town’s term limit ordinance. Hilton said that reducing the approved legal funding would force the Selectboard to be more frugal in seeking legal advice, and indicated that the board could ask for more legal funding via special town meeting if needed. 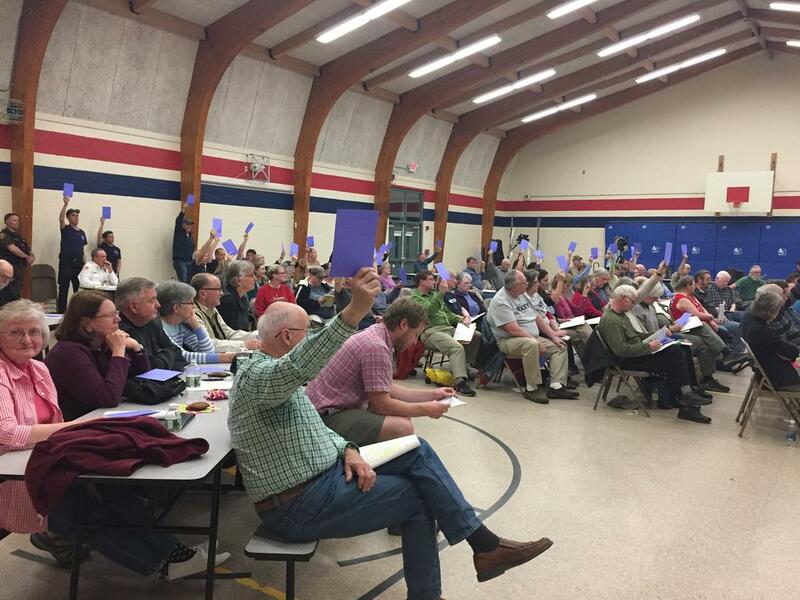 Residents at last year’s town meeting voted 66-44 in favor of the ordinance that limited Selectboard service to three consecutive three-year terms, and required members to be off the board for three years before running for it again. In early April, the Selectboard voted 3-2 to find the ordinance legally invalid. Two of the board members who voted to invalidate the ordinance, Chairwoman Linda Chase and Vice Chairman Steven Libby, were set to be term-limited this year and next year, respectively. “Linda and Steve should have recused themselves because they’re the people most affected by whether that ordinance was enforced or not,” said Hilton, who added that she consulted an attorney and found she had no legal standing to challenge the vote. Libby responded that cutting the stipend for selectmen wouldn’t affect his service on the Selectboard, and argued that the board followed state law in its term limit vote and that Chase properly acknowledged that the vote would affect her. At the heart of the term limit legal debate is New Gloucester’s lack of a town charter. An attorney at the Maine Municipal Association has said the lack of charter invalidates the term limit requirement, while a town attorney from law firm Bernstein Shur has been less definitive on that point. Town attorney Philip Saucier advised last year that the term limit ordinance could be placed on the 2017 town meeting warrant, but noted there was an open question as to its legality. “On the other hand, the court has held that under home rule the Legislature has not implicitly denied any power granted to municipalities unless the municipal ordinance in question would frustrate the purpose of any state law,” he said in a January 2017 email to then-Town Manager Paul First. In an email to current manager Carrie Castonguay following the April vote, he reiterated that there is no case law on the issue and it is not clear how a judge would rule. “However, we believe the stronger legal position is that the town can only impose term limits through the adoption of a local charter,” Saucier said in his April 5 message to Castonguay. Selectboard Member Stephen Hathorne helped lead the initial term limit effort and said he was “absolutely disgusted” when the board voted to invalidate the ordinance in April. Chase and Hathorne are both on the ballot in this year’s election. Hathorne said Monday he supported Hilton’s proposed amendment to reduce Selectboard and legal spending, which ultimately failed by a wide margin. Also at the meeting, moderated by Libby’s brother, Donald Libby, New Gloucester Fire & Rescue Department Deputy Chief Roger Lavasseur repeated concerns about department compensation that he and other officers have raised before the Selectboard and budget committee – an issue they say dates back to the early 2000s. Carrie Castonguay said in March that the town is working towards paying members of the largely volunteer Fire & Rescue Department at an hourly rate without making them full-time employees with salaries or benefits. New Gloucester voters approved nearly all of the warrant articles at the May 7 annual town meeting. The only measures to fail were related to how the town manages tax-liened properties and a potential gift of property from the Royal River Conservation Trust.